When my wife and I left the East Coast for the West Coast in the late '90s, we quickly began looking for a home. We soon discovered that the key question to ask sellers was not “How energy efficient is the home?" but “Has the home been retrofitted?" The climate in Northern California is much more temperate relative to the East Coast, but in the West you need to consider the potential for earthquakes. The home's foundation thus becomes one of its most important features, as a strong one can make your home resistant to even major tremors. My wife and I ended up buying a home that had recently been gutted and rebuilt to meet California's tough earthquake standards. It made us feel safe in our new environment, especially as we dealt with a threat with which we were unfamiliar. The foundation of the market is made up of revenue, earnings and consumer spending. Historically, at this mid-to-late point in an economic expansion cycle, revenue growth tends only to range between 4 to 6%. This past quarter, revenue growth came in at 10.3% compared to the same quarter last year. Seeing topline growth surge is a positive, transparent sign of success. Earnings were also robust, with S&P 500 earnings for the second quarter, as measured by Thompson Reuters, up 25% year-over-year. This reflects the strength of revenues as well as the cut in the corporate tax rate. Not to be left behind, profit margins are also at all-time highs. Profit margins, defined as earnings divided by revenues, rose to a record 10.9%. This comes in spite of all the talk about rising input costs and higher wages. Even if margins were to come down slightly from these record levels, history shows that equity market rallies can continue even as margins contract. Remember, it wasn't too long ago that we were writing about the five-quarter-long earnings recession. It seems as if companies have come out the other side in excellent condition. Consumers, who represent two-thirds of the U.S. economy, are also performing admirably. Consumer spending, bolstered by last year's tax cuts and a strong labor market, increased at a healthy clip of 0.4% in July. After a strong July, retail sales moderated in August, but are up 6.6% year-over-year. And retail sales should continue to be supported by consumers' upbeat outlook as measured by the Conference Board's consumer confidence index, which jumped 5.5 points to 133.4 in August, its highest level in 18 years. Such a strong reading of consumers' assessment of current business and labor market conditions should bode well for consumer spending moving forward. We believe that earnings and consumer spending will continue to be the major drivers of the equity market's upward trend going forward. How Long Can the Bull Run? The current equity bull market, which began in March 2009, recently extended its nearly 3,500-day run to become the longest bull market ever on Wednesday, August 22, 2018. In fact, since the market low in 2009 through the end of August, this market has gone on to make about 200 new daily highs. Despite this, there has been much debate along the way over this market's ability to continue to climb, with many claiming its days were numbered just because of the bull's extraordinary length. We have not been among these skeptics, and are not about to join them now. I have always looked at new highs not with fear, but with positive anticipation. Exhibit 1 shows why. 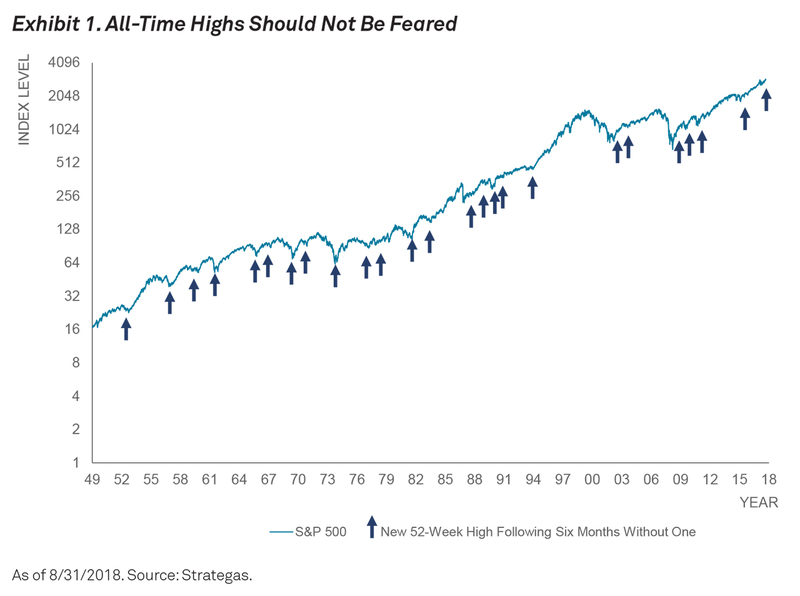 Historically, hitting a new 52-week high after having gone six months without one has been a positive sign for markets going forward. While this chart shows the market may be predicting its own healthy future, we believe the economic backdrop also supports this view. The recently released 4.2% second quarter GDP figure continues to illustrate that the U.S. economy remains on very stable footing and seems to be gaining momentum. The rest of the world, however, is having trouble keeping up, with some signs of slowing in the Eurozone and some emerging market countries (including China). This should continue to have positive ramifications for global growth as a whole. Our view continues to be that the U.S. will grow at above the long-term trend growth rate of 2% in 2018, at trend in 2019, with the potential of below-trend growth not happening until 2020. This should prove a good backdrop for global equity markets in the near-to-intermediate term, especially if inflation remains contained. With that said, there are potential risks that could disrupt this bull market. While trade negotiations are showing signs of progress, there is the potential for tensions to escalate between the U.S. and China and negatively impact our growth outlook and the markets. Or, we could see a quicker trade resolution resulting in stronger economic activity and potentially hotter inflationary pressures, which could cause the Federal Reserve to increase short-term rates at a faster pace than the market is expecting. While we don't foresee either of these scenarios transpiring, we continue to watch developments on the trade front and how it may impact the long global expansion. Also on our radar are the U.S. midterm elections and ongoing weakness in emerging markets, which could cause additional bouts of volatility. Rather than look at this bull market's age, we prefer to focus on the fundamentals, which appear to remain strong. U.S. economic growth is leading the global expansion, and while corporate earnings may have peaked in the second quarter with a 25% year-over-year growth in earnings, we still expect companies will deliver solid earnings in the quarters to come. Although there are risks to monitor, this market has been extremely resilient and able to withstand the daily storms thrown its way. So although this market may be in unfamiliar territory because of the length of the rally itself, relying on a strong foundation should enable equity markets, especially those in the U.S., to continue to press higher. This white paper is the property of BNY Mellon and the information contained herein is confidential. This white paper, either in whole or in part, must not be reproduced or disclosed to others or used for purposes other than that for which it has been supplied without the prior written permission of BNY Mellon. This material is provided for illustrative/educational purposes only. This material is not intended to constitute legal, tax, investment or financial advice. Effort has been made to ensure that the material presented herein is accurate at the time of publication. However, this material is not intended to be a full and exhaustive explanation of the law in any area or of all of the tax, investment or financial options available. The information discussed herein may not be applicable to or appropriate for every investor and should be used only after consultation with professionals who have reviewed your specific situation. The Bank of New York Mellon, Hong Kong branch is an authorized institution within the meaning of the Banking Ordinance (Cap.155 of the Laws of Hong Kong) and a registered institution (CE No. AIG365) under the Securities and Futures Ordinance (Cap.571 of the Laws of Hong Kong) carrying on Type 1 (dealing in securities), Type 4 (advising on securities) and Type 9 (asset management) regulated activities. The Bank of New York Mellon, DIFC Branch (the “Authorised Firm") is communicating these materials on behalf of The Bank of New York Mellon. The Bank of New York Mellon is a wholly owned subsidiary of The Bank of New York Mellon Corporation. This material is intended for Professional Clients only and no other person should act upon it. The Authorised Firm is regulated by the Dubai Financial Services Authority and is located at Dubai International Financial Centre, The Exchange Building 5 North, Level 6, Room 601, P.O. Box 506723, Dubai, UAE. The Bank of New York Mellon is supervised and regulated by the New York State Department of Financial Services and the Federal Reserve and authorised by the Prudential Regulation Authority. The Bank of New York Mellon London Branch is subject to regulation by the Financial Conduct Authority and limited regulation by the Prudential Regulation Authority. Details about the extent of our regulation by the Prudential Regulation Authority are available from us on request. The Bank of New York Mellon is incorporated with limited liability in the State of New York, USA. Head Office: 240 Greenwich Street New York, NY 10286, USA. In the U.K. a number of the services associated with BNY Mellon Wealth Management's Family Office Services– International are provided through The Bank of New York Mellon, London Branch, 160 Queen Victoria Street, London, EC4V 4LA. The London Branch is registered in England and Wales with FC No. 005522 and #BR000818. Investment management services are offered through BNY Mellon Investment Management EMEA Limited, BNY Mellon Centre, 160 Queen Victoria Street, London EC4V 4LA, which is registered in England No. 1118580 and is authorised and regulated by the Financial Conduct Authority. Offshore trust and administration services are through BNY Mellon Trust Company (Cayman) Ltd. This document is issued in the U.K. by The Bank of New York Mellon. In the United States the information provided within this document is for use by professional investors. This material is a financial promotion in the UK and EMEA. This material, and the statements contained herein, are not an offer or solicitation to buy or sell any products (including financial products) or services or to participate in any particular strategy mentioned and should not be construed as such. BNY Mellon Fund Services (Ireland) Limited is regulated by the Central Bank of Ireland BNY Mellon Investment Servicing (International) Limited is regulated by the Central Bank of Ireland. BNY Mellon Wealth Management, Advisory Services, Inc. is registered as a portfolio manager and exempt market dealer in each province of Canada, and is registered as an investment fund manager in Ontario, Quebec, and Newfoundland & Labrador. Its principal regulator is the Ontario Securities Commission and is subject to Canadian and provincial laws. BNY Mellon, National Association is not licensed to conduct investment business by the Bermuda Monetary Authority (the “BMA") and the BMA does not accept responsibility for the accuracy or correctness of any of the statements made or advice expressed herein. BNY Mellon is not licensed to conduct investment business by the Bermuda Monetary Authority (the “BMA") and the BMA does not accept any responsibility for the accuracy or correctness of any of the statements made or advice expressed herein. Trademarks and logos belong to their respective owners. BNY Mellon Wealth Management conducts business through various operating subsidiaries of The Bank of New York Mellon Corporation. ©2018 The Bank of New York Mellon Corporation. All rights reserved. Jeff Mortimer is the director of investment strategy for BNY Mellon Wealth Management. In this role, he leads a team that sets capital market expectations and is responsible for making asset allocation recommendations. Jeff has more than 25 years of experience in the financial services industry.